Hagfish are craniata in the class Agnatha or Myxini. Hagfish do not have a skeleton, except they do have a skull, which is made of cartilage. Because of this, many researchers think Myxini should not be in the subphylum Vertebrata. However, because of its fins and gills, they are called fish. They are marine, meaning they live in the sea. The original 19th century classification groups hagfish and lampreys together as cyclostomes (or historically, Agnatha), as the oldest surviving class of vertebrates alongside gnathostomes . An alternative scheme proposed that jawed vertebrates are more closely related to lampreys than to hagfish, so vertebrates include lampreys but exclude hagfish. Recent DNA evidence supports the original scheme. Hagfish are usually about half a meter (18 in) long. They have long, eel-like bodies. Hagfish's eyes are small and not very useful, because the hagfish uses mostly its senses of smell and touch to find food. The whiskers near the hagfish's mouth are called barbels, and are used for touching. They have four hearts, two brains, and no backbone. A fish which looks like the hagfish is the lamprey. Hagfish eat invertebrates (animals such as worms) and are also scavengers, eating fish which are dead or dying. Hagfish have four sets of teeth on their tongue to bite pieces of flesh from its prey. They use these tongue teeth to eat. The teeth pinch together to lock onto its food, helping it tear into dead and dying fish which have sunk to the bottom of the sea, where it lives. Often, a hagfish digs into the dead fish that it is eating, removing the insides of the dead fish. Usually, people only see hagfish when nets that sweep the sea floor are pulled up. Every fish, even the dead ones at the bottom of the sea, are brought up into the boat by the net. In some of those dead fish, hagfish are found eating. The smelly fish are dumped onto the deck of ships with the hagfish poking out from their bodies. When hagfish are afraid, they make slime. This slime comes out of the sides of the hagfish's body. They are able to make enough slime to completely fill a two-gallon bucket. The reason such a small fish can make so much slime is because the slime comes out in strings that quickly swell up much bigger when they are in the water.Their unusual way of eating and their slime has made many people call the hagfish the most "disgusting" of all sea creatures. Although hagfish are sometimes called "slime eels," they are not eels at all. Kkomjangeo bokkeum (꼼장어 볶음), Korean stir-fried fish dish made with the hagfish Eptatretus burgeri. Hagfish are usually not eaten by humans in most countries. 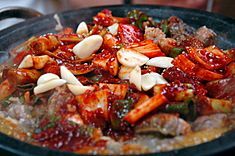 However, meat from the inshore hagfish (a type of hagfish known as kkomjangeo (꼼장어) or meokjango (먹장어) in Korean and Nuta-unagi in Japanese) is a popular food in Korea. A bag made from eel skin. Hagfish skin is used to make leather for wallets and belts. When this leather is sold, it is called "eel skin". Scientists are studying hagfish slime to see if they can use it to make things. The strings of protein in hagfish slime are thin and strong, so they are a useful material. Because it is not made from oil, hagfish slime would be more environmentally friendly than the plastics that we use now. Hagfish Facts for Kids. Kiddle Encyclopedia.